Brinson Kinzer, elected to the Scott County Board of Supervisors for 2015-2019 and re-elected for a second term, sworn in January 2019. Brinson was raised in the West end of Davenport and attended Davenport Central High and Scott Community College. Brinson has been employed as an electrician since his apprenticeship starting in 1985, and currently holds the position of full time Safety Director with a local electrical contractor. Brinson served three terms on the Blue Grass City Council, and was recently on his third term as Mayor of Blue Grass before being elected to the Scott County Board of Supervisors. Brinson and his wife Donna have one son, Justin, who is a plumber apprentice and serves as a volunteer firefighter in Blue Grass. 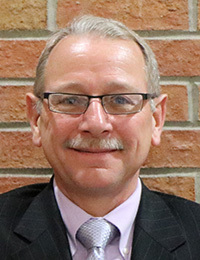 Supervisor Kinzer serves on the Scott County Watershed Cabinet, the Workforce Development/Region 9 Chief Elected Official Board, and Bi-State Regional Commission. Residence: 304 E. Lotte St.